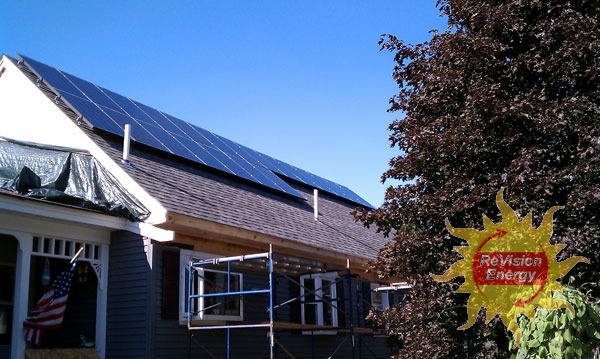 This 4.8kw solar electric system in Meredith, New Hampshire benefited from the $6,000 cash rebate. 1.4 megawatts of solar electric were installed during the course of the program, enough to offset 2.5 million pounds of C02 each year, the equivalent of removing over 200 cars from the road, or planting more than 6,000 trees. As expected based on order of notice DE10-194 and the pursuant public hearing (see our coverage here), New Hampshire has reduced their residential solar electric rebate. In the original notice, the expected drop was from $3/watt, $6,000 max to $1.5/watt, $3,000 max. The drop was not as dramatic as original anticipated. Instead, the new rebate structure is $1.25 per watt up to a maximum of $4,500. We will continue to offer our residential solar hot water rebate program, a well-funded program offering generous state and federal rebates, and a residential wood pellet heating rebate program offering rebates of up to $6,000. In addition, we will soon be offering a commercial and industrial rebate program for solar electric and solar hot water systems, and this winter we will issue a Request for Proposals to offer funds for renewable energy projects on a competitive basis. As more funds become available we will look to offer rebates for additional renewable energy technologies. Our mission is to offer an array of financial incentives for those who are ready to invest in a clean energy future. We appreciate Ruderman’s upbeat attitude, particularly in regards to pushing the upcoming commercial and industrial rebate program. We’re eager to see how New Hampshire is able to encourage businesses to lock in their utility rates and offset their C02 emissions. For full information on the changes, see the full Order DE 10-194 (PDF). How Does This Affect The Affordability of Solar Electric? Even with the reduced cash rebate, purchasing a solar electric system locks in an electric rate better than what’s offered by the utility. Taking the long view, solar electricity is still an excellent investment – one that will provide tens of thousands of dollars of energy savings over its first 25 years and probably will continue to operate for nearly double the lifetime calculated here! Stay tuned here for news about the business and industrial rebate, we’ll post it as soon as we know, probably the same day the order is given.